Belle in the Burbs...: 7 Weeks Pregnant! 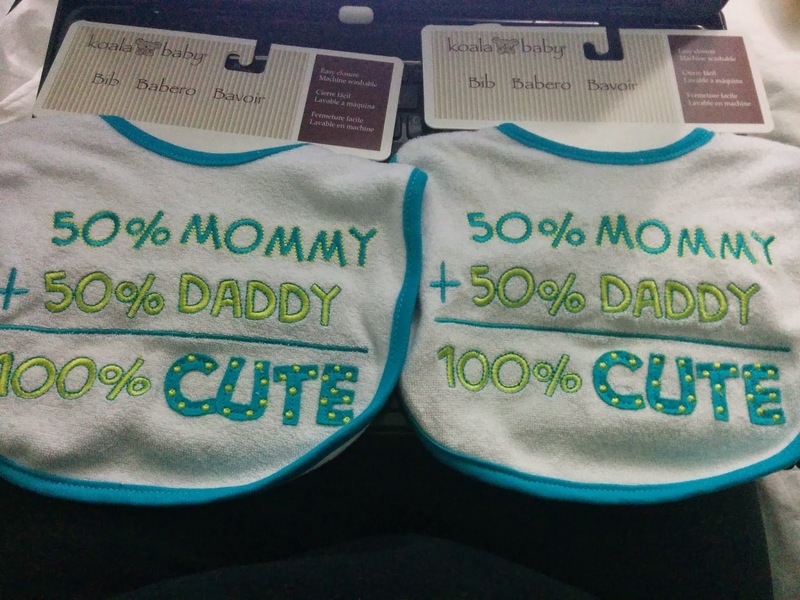 Favorite moment this week- We bought the first items for our babies. We got them matching bibs at Babies R Us. Also, hubby's mom bought one car seat, and we bought the other! Miss Anything: I miss my old taste buds. Many of my all time favs (black walnut ice cream, can't look at sushi, and etc) don't taste or look the same. I am having a hard time drinking water too! Food cravings- I'm still loving Mexican, but hamburgers took over this week! Anything making you queasy or sick- YES! I have been nauseous but still not vomiting. I am very sensitive to smells, and have found myself repulsed by veggies :(. I feel like I can eat ONLY when the meal starts off with bread or some type of carb. I feel so guilty for the amount of carbs I have been eating. Everything else grosses me out though! Have you started to show yet- I think so! I have not gained any weight, but I feel so bloated. I haven't been measuring, but I am sure my belly is growing. Some of my pants are tighter at the waist! Stretch Marks: Just the ones I had pre-pregnancy lol! Gender- Don't know! I'm thinking a boy and a girl...or either two boys lol. Sleep: What's that? I am exhausted all of the time, but cannot nap or sleep well. Looking forward to: Feeling better with not so much nausea. Also, I can't wait to reach the 12 week mark! Other Notes: I am irritable, and most people bother me lol. I have lost all interest in watching any of my favorite youtubers. Also, we found out earlier in the week (on 3/24/14) at 6w5d that we're pregnant with twins!